(Montana High Tech Business Alliance) Founded by a pair of former Forest Service employees in 1966, planning and design firm WGM Group’s first project was the lift at Montana Snowbowl, just in time for the 1967 world championship ski races. The ski lift project, still standing though no longer in use, was the first of a series of projects for the city of Missoula, Dennis Washington, and various subdivision work. A lot has happened in 50 years. Today, WGM Group is involved with some of the biggest construction projects in western Montana, including the ongoing Old Sawmill District development and the upcoming Innovation Corridor. It saw 50 percent growth last year as the firm brought its total number of employees to 75. And WGM continues to expand their offerings and use high-tech tools and a diverse team to tackle unique challenges. President and CEO Brent Campbell said it can be hard for established businesses to adapt to a changing economy, but his passion for economic development and entrepreneurship help keep him sharp and open to new ideas for WGM. He serves on the boards of Montana Ambassadors, Missoula Economic Partnership, and Montana High Tech Business Alliance, and he hosts local business networking events such as Hellgate Venture Network. Campbell’s passion for economic development stems from his experience of not being able to find a Montana job after college. Originally from Helena, Campbell got his engineering degree from Montana State University in Bozeman and later received an MBA certificate from the University of Montana. After he graduated college, Campbell had to leave Montana to find a job. He worked as an engineer for 10 years outside the state before he was able to return and begin working for WGM as a Senior Project Manager in 1994. Twelve years later, he became the company’s third CEO in its 52-year history. Campbell said he’s glad Montana’s economy has grown stronger and offers more job opportunities to recent graduates, including jobs right at WGM Group. The Old Sawmill District is a 46-acre area along the Clark Fork River in Missoula that was once home to a sawmill complex. For more than 80 years, the area was exposed to the by-products of an operational sawmill, which included discarded sawdust and woodchips, underground pollution, and hazardous waste. When the sawmill closed in the early 1990s, the site wasn’t suitable for development without extensive remediation. In the early 2000s, a plan hatched to rehabilitate the central location into a modern urban neighborhood, complete with places to live, work and play. Not only did WGM draw up the cleanup plan to help prepare the area for development, but they worked with the city to obtain the proper environmental permits for the cleanup and physically removed the contaminated materials. Far from the survey techniques of the past, WGM utilizes computer-aided design (CAD) software and sophisticated GPS-enabled survey scanners to digitally map development areas. The scanner essentially spins a laser around a site, reflecting light back to the equipment and painting a point map of the surrounding terrain. Once WGM has uploaded that data into vectorization software, it can then go into the CAD software where they generate a computer model of what needs to be built and upload it right into the construction equipment. “Our survey has changed dramatically with technology,” Campbell said, adding that the firm is one of the only users of the specialized vectorization software in the western U.S.
WGM worked with a team of environmental and cleanup scientists, hydrologists, contractors, and civil, mechanical, and electrical engineers to get the Old Sawmill District where it is today. For their work on the project, WGM was featured in an issue of Engineering, Inc.
Campbell said the firm also worked with the city of Missoula to build a 16-acre park on the river and streets to connect existing thoroughfares. As the area began to become more habitable, WGM worked to help build housing and commercial spaces for businesses to relocate and grow. The Old Sawmill District has seen ample change, but Campbell said the project is just getting started. Future developments will include restaurants, bars, and townhomes. 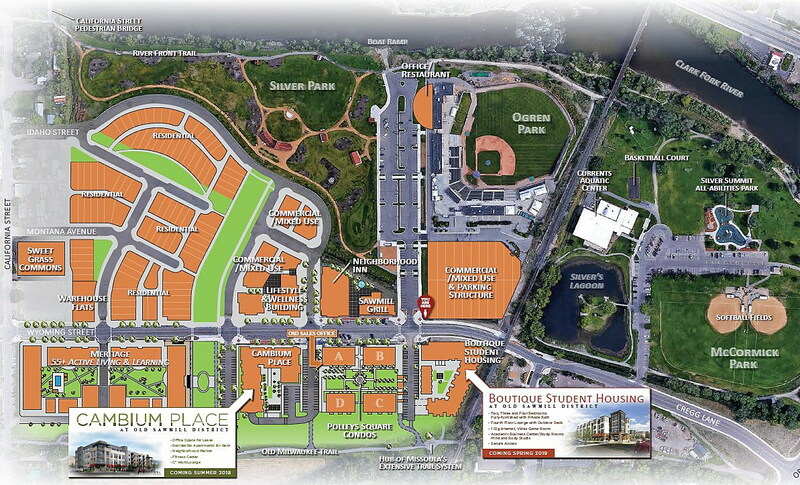 While the Old Sawmill District project is in full swing, the Innovation Corridor is still in the planning stages. Created through a series of public-private partnerships, the Innovation Corridor is an effort to connect mature businesses and entrepreneurs across northern Missoula with spaces and resources to help inspire innovations. Where other groups have focused on higher-level concepts and the vision for the Innovation Corridor, Campbell is thinking functionality. In addition to private infrastructure projects, WGM Group has done extensive work in hydrology, and water and environmental rights around the state. The firm also recently hired a Montana State University professor to develop biotechnology that offers clients an option for alternative on-site wastewater treatment. With an increasing focus on environmental engineering and technology, Campbell said the company is staying true to its roots. He added that projects like the Old Sawmill District and the upcoming Innovation Corridor in Missoula can be “collision” opportunities that can result in sparks between entrepreneurs and mature businesses. He also encourages his employees to interact with entrepreneurs to help inspire them. Most WGM employees work out of the Missoula headquarters, though the company is expanding its presence across the state. 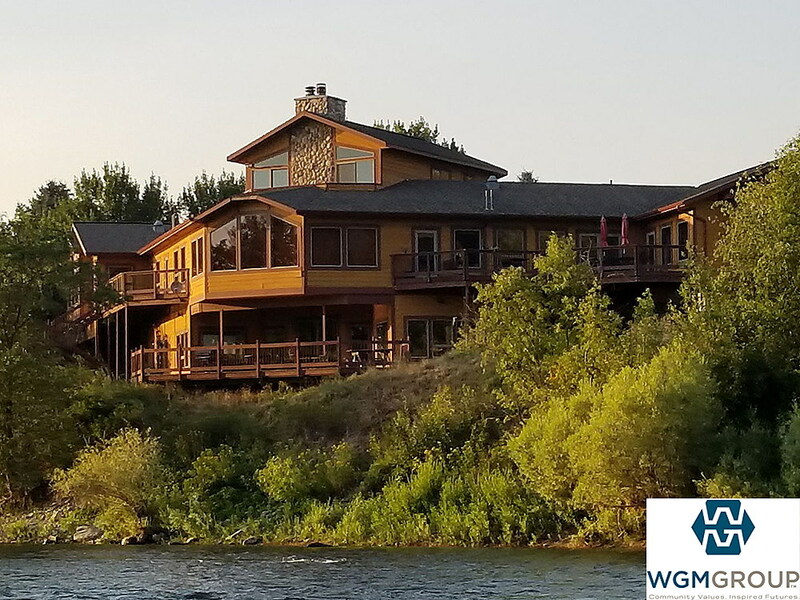 WGM has offices in Bozeman and Kalispell, as well as a remote worker in Helena. One Missoula employee is Erica Laferriere, a project assistant for the environmental consulting team. A Bozeman native, Laferriere got an environmental studies degree from UM in 2010 and started working for WGM about three years ago. Laferriere works on a variety of projects, including preparing environmental reports and proposals. WGM is training Laferriere in permitting for the National Environmental Protection Agency (NEPA) and the Montana Environmental Protection Agency (MEPA). WGM provides a lot of opportunity for advancement, she said. Volunteerism and family time also are key for WGM employees. Like many employees at the company, Laferriere donates time to the Missoula community. She works with CANdemonium, a competition in which teams gather canned food donations and work with mentor architects and engineers to design and build structures. All of the food from the competition goes to the Missoula Food Bank. While the firm emphasizes high quality work, it also allows flexibility in the office to ensure employees enjoy a healthy work/life balance. Laferriere said flexible schedules allow employees to pursue personal passions at their own pace; for example, a heavy work week may be balanced by a three-hour lunch visit to the ski slopes, in the shadow of the ski lift that started it all.